YES, Please give us a call at 575-754-1700. Long pants, shirt and cowboy boots are preferable. If you don’t have cowboy boots, then you need to wear a sturdy pair of shoes. NO SANDALS! In case of inclement weather, please bring a rain jacket and hat. If it is a nice sunny day then sunscreen is a must! Unless it is a thunder storm we will still go out. Sometimes it will delay the ride for a bit, but that’s what happens in the mountains. YES, depending on the age and size of the child and any doubles can only go on the 1 hour tour! How old to you have to be to ride? Do you have gentle horses? 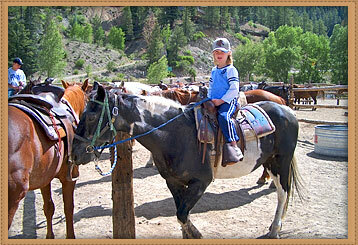 YES, we have horses for all levels of riders. As of now, we accept personal checks and cash only, no credit cards. parent or legal guardian sign or they cannot go!